It's a long time since I first developed an interest in clothes and shoes, and since I was in my early twenties I've been trying to pay particular attention to the way I dress. I am now in my late thirties. I had just started university in Norway when I first began wearing suits on a daily basis. Later I went on to study in both Australia and England. Neither Norway or Australia is known for their sense of style, and even in England, where the sartorial has a stronger position, is it quite rare to see suits at most universities. Needless to say that I was usually the only person in a suit, with the possible, but rare, exception of a lecturer. Anyway, I stuck with it because suits make me feel comfortable, and dressing down to conform with the majority is a very dubious exercise. At the time, the knowledge was lacking and many years should pass before I even heard of bespoke tailoring and even longer before I actually owned a piece of bespoke clothing. I also doubt I would have been able to afford it as student budgets rarely leave room investing in bespoke suits. Thus, my suits at that time were always cheap and of varying quality and I'm sure I made dressing mistakes on a regular basis, but you got to start somewhere. Anyway, I still remember some of my early suits. Two suits in particular have left a lasting impression, but for different reasons. The first one I remember mainly because it had a famous name attached to it. This was an olive green, three piece, Pierre Cardin suit which I had managed to pick up quite cheaply and, although I never said so out loud, there was a certain pride in owning a suit from a famous designer. The other I remember was a darkish grey suit bought at H&M. This was probably the cheapest suit I've ever bought, but also a suit which was worn more extensively than most other suits I've ever owned. My suit collection looks quite differently now and the way I buy my suits have changed significantly but if it hadn't been for these early purchases I wouldn't have been where I am today. Dressing well is not about wearing the most expensive garments but rather to make the best of what you've got and work within the budget available to you. That said, I would encourage all to opt for the best possible quality and move on to better quality clothing as the wardrobe grows. Also, please, don't confuse quality with expensive brands. There is usually a proportionality between price and quality, but in some cases you'll pay a disproportionate amount for the brand rather than the quality of the clothes the brand produces. Pay attention to what you buy and seek out quality without being blinded by the fame or popularity of the brand! If you are new to buying suits and want to enter at the lower end of the price range, I think I would probably recommend Marks & Spencer. They offer suits and blazers for as little £99. There are many other companies offering suits in the same price range and maybe even cheaper, but the reason I think M&S is a good starting point is that I believe they offer a reasonable quality considering the price. You could, of course, do as I did when looking for my first suit, see what H&M has to offer. Another option, and in my opinion a better one, is to get a suit of much better quality and design when one of the more upmarket retailers have a sale on. If you're on a budget but have a bit of patience you can really get hold of some fantastic bargains during the end of season sales. 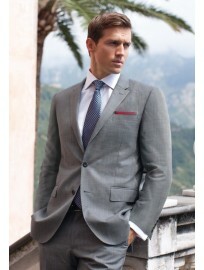 You'll be hard pressed to find a suit for £99 but should be able to find a good selection between £170-£250. Brook Taverner and Savile Row Company actually have a sale on right now with some excellent bargains up for grabs. Another retailer which I like very much is Charles Tyrwhitt but, unfortunately, their big sale has just ended (still have some good offers though). I actually managed to pick a few Tyrwhitt bargains a couple of weeks ago. I bought five shirts and a boating blazer, and I must say that very pleased with both the design and quality. From before I have an overcoat from Tyrwhitt which has served me well for several years. A fourth and last retailer I would like to mention is Ted Baker which has a distinctive design which can be very appealing. When buying clothes online they may not always fit perfectly, but remember you can always have them altered. Below I have included three examples from the many suits available from the above mentioned retailers. 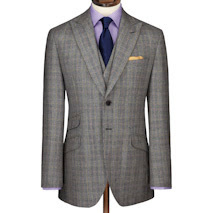 The first is Prince of Wales check suit from Brook Taverner made from super 130's Italian wool. 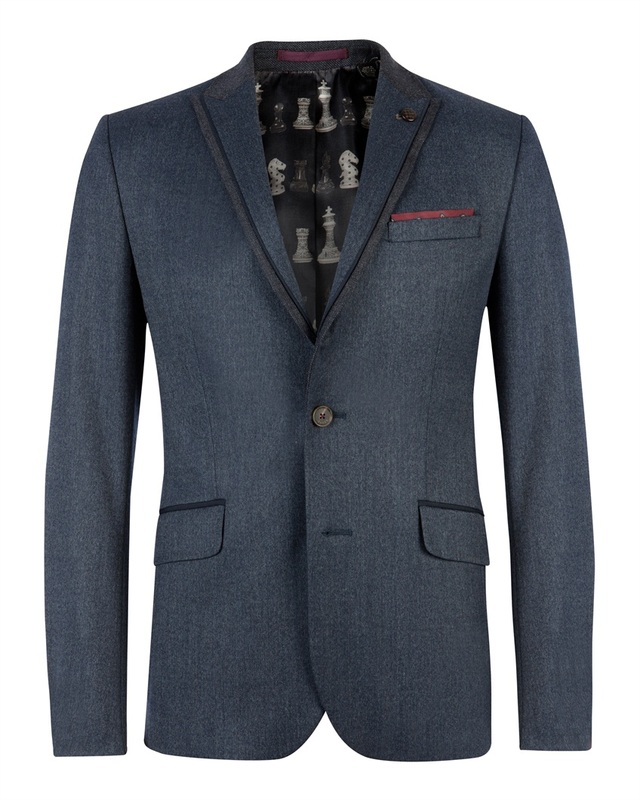 This suit is now available for £175, priced down from £400. The second is a contrast lapel blazer from Ted Baker retailing for £299. The bottom one is a grey glen check suit available for £349, down from £700. It is possible to buy a decent suit on any budget, just look around and have a bit of patience. The photos are from the respective retailers' web sites. Some years ago I took another step up in the world of suits and ventured into the realm of bespoke clothing. That was a step I was somewhat apprehensive about taking and I spent quite some time building up the courage to book an appointment with a tailor. I had always thought bespoke suits were for the selected few, the rich and famous, and I wasn't at all sure if this was something I could do. I couldn't have been more wrong, however, and making that first measuring appointment is one of the best decisions I've made. I'll write more about that in part 2 of this post.